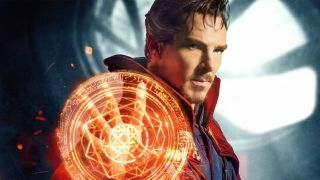 Has Benedict Cumberbatch let slip how Fox’s Marvel characters join the MCU? It’s a good problem to have, but Marvel will soon find themselves stuck between The Thing and a hard place. Yep, Fox’s Marvel characters are now back under the Marvel movie umbrella – but how on earth are they going to integrate them into the MCU? Sorry, that should say how on earths – because Doctor Strange himself, Benedict Cumberbatch, might have (accidentally) spilled the multiverse beans. Wow. Where to start? Firstly, of course Cumberbatch drops a casual ‘couture’ in there, the clever clogs. Secondly (and more importantly), what about these other dimensions? Marvel – and comic book properties in general – have often used multiverses to explore other stories away from their main timelines. Now, though, it looks to work as the perfect opportunity for X-Men, Deadpool, etc to segue into the MCU. It wouldn’t be the worst idea in the world to completely separate Fox’s properties from Marvel’s current batch via the hand-waving magic of explaining it away through multiverses. However, if Avengers: Infinity War or Avengers 4 intends for Thanos to rip a hole through space and time, it seems far more likely that multiverses will collide and bring much-loved characters together. After all, we don’t want a billion Fox origin stories, and, yet, we can’t have Wolverine just show up out of nowhere and be all like ‘Hey’ when, for example, S.H.I.E.L.D has known about Black Panther for nearly a decade. Benedict Cumberbatch clearly chose his words very carefully and, still, he may have just revealed a little too much. Here’s hoping anyway.